The inertial sensor of choice is the InvenSense MPU-9150 chip, that has low drift and low power consumption in a very small package. This sensor contains a 3-axis gyroscope, 3-axis accelerometer and a 3-axis magnetometer. Processing and calculation of these data sets is carried out at the basestation of the system and is covered below in The Algorithms. This data is sent over Bluetooth, using the latest standard, 4.0 Low Energy. Bluetooth was selected, to transmit data to a handheld device, in order to benefit from a significan reduction in power consumption. The handheld device could be a smartphone or even a custom piece of hardware for First Responders. This device collects the sensor data and combines with any additional sensor data of its own, to pass over a High Frequency radio link, to a basestation. Accelerometers and gyroscopes provide high sample rate inertial measurements, however inertial measurements must be integrated multiple times to obtain the displacement. This leads to exponential growth in positioning error. Filtering is implemented in our algorithms to reduce noise propagation, prior to integration. Initially we are using a basic Kalman filter, but higher order filters will be explored throughout the project. Zero Update is effectively live calibration, thanks to the mechanics of the human foot - each foot is held stationary for a significant period of the step cycle. This is illustrated in the figure left. 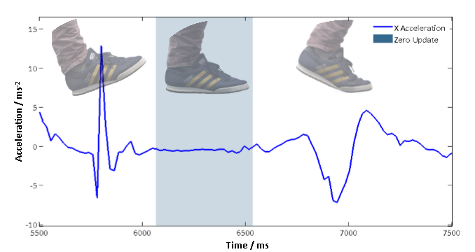 As the device undergoes high accelerations during steps, stationary periods can be detected to remove accumulated errors, improving the acccuracy of positioning. The detected stationary period is highlighted on the figure also.